I wasn’t feeling well yesterday and didn’t get much done at all. You know how it is when you get back from a trip — you’re tired and in some cases, fighting off all the airborne viruses from planes, hotel rooms and theatres. I did test this Pumpkin Cheesecake Topped Bundt, though. This turned out great and seems to have gotten even better after sitting around. No one has tested this but me, but I had such good results I feel comfortable posting it after one try — no water bath needed, no cake mix, just 20 minutes to make. There is a lot of passive time involved — bake time, cool time, chill time. Of course, that’s a good thing! Todd and I aren’t huge pumpkin pie fans, but we both liked this because the pumpkin flavor was rather mild. Preheat oven to 350 degrees F. Spray a 12 cup bundt pan with flour-added cooking spray. In a mixing bowl, beat softened cream cheese and both sugars until smooth. Stir in eggs, pumpkin, cornstarch, vanilla and pumpkin pie spice or spice combo. Pour into bundt pan and bake for 15 minutes. While pumpkin mixture bakes, combine cocoa and chocolate in a small saucepan; pour hot coffee over chocolate and whisk until smooth - if coffee is not hot enough to melt chocolate, turn heat to medium and heat just enough so that chocolate melts; Remove from heat (if using) and whisk in sour cream. In a second bowl, whisk together flour, salt, and baking soda. Using electric mixer, beat butter, brown sugar, and vanilla on medium-high speed until pale and fluffy, about 3 minutes. Add eggs and continue beating for another minute. By hand, stir 1/3 of the flour mixture into batter. Add half of the chocolate/sour cream mixture and stir until incorporated. Scrape bowl and add remaining flour mixture and all of remaining chocolate mixture. Remove bundt cake pan from oven and quickly pour chocolate mixture over pumpkin. Return to oven and bake for 42 minutes or until wooden skewer inserted into center comes out with few crumbs attached. Cool in pan 30 minutes, then invert cake onto parchment paper or cake plate. Let cool at room temperature for 1 hour, then transfer to refrigerator to chill. 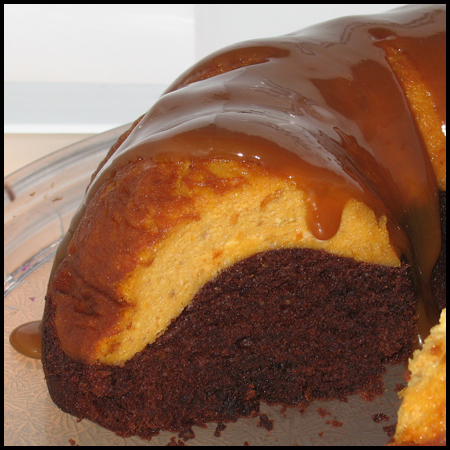 Before serving, drizzle with dulce de leche or caramel sauce. Bummer! That sounds like something I would have done. At least you got to taste it :(. Well, I made this recipe today. I love pumpkin and chocolate recipes. I pretty much followed your recipe, I probably used a little extra spice but that’s about it. The cake was all the way above the top of the pan when I took it out from the oven but it sunk down a good inch during the half hour wait. It slipped right out of the pan. Unfortunately, my hand slipped and I dropped half the cake on the floor and the remaining part is battered from my manoeuvering to save it as I realized the cake was falling. Anyway, it’s really delicious, I had to serve it in bowls because of the mishap. I hope to get up the courage to try it again someday! Jackie, thanks for the review. I’m more of a cheesecake person than a pumpkin person, so maybe that’s why I liked it. I’ll bet you could increase the pumpkin and perhaps the spices without ruining the cake. First–love the site! Thanks for all the great recipes. Now, for the cake. Making it was much easier than I expected. That was good. The cake got mixed reviews at the party I made it for. Everyone loved the chocolate part, but the pumpkin part wasn’t as well loved. My husband thought it was way too easy on pumpkin flavor which is good if you don’t like pumpkin but bad if you do. Overall, I’d say it was received fairly well, but the chocolate part was the hit. I made this dessert this afternoon and just had my first piece. Absolutely delicious! I love raspberry and chocolate together so I am going to look for a raspberry cheesecake to go with the chocolate next time. Thank you so much for this recipe!! Kenda, I have never heard the term pumkin-a-holic. At any rate, this is your time of the year. Peabody, I hope you try it. A few people have tested it so I’m feeling pretty comfortable with it as is. Oh my gosh, how did I miss this? I’m glad I went looking back through your blog. Wow, I’m a pumpkin-a-holic and I can’t wait to try out this recipe! Thanks for sharing! It is official, I must now purchase a bundt pan for all of these awesome recipes. T. Marti, I hope you try it. Grace, I emailed you re: this, but wanted to say thanks again for being innovative and trying it out in the pot. I’m glad it worked out, since cheesecake can be tricky and like the other one, cooking this one is like baking cheesecake blindfolded. Cornstach, not corn syrup, is what’s used in the pumpkin. It helps prevent cracking. I made this cake yesterday almost immediately after I saw the photo, but had to halve the recipe because I don’t have a 12C bundt (no storage in my teeny NYC kitchen). Instead of baking it in a flat 8″ pan I baked it in a pot with a flat bottom and graduated sides- it turned out yummy, and is a great size for my 2 person household. I didn’t use the caramel sauce as I thought it was already perfectly sweetened, so just shook on some powdered sugar. I did find the cake portion a little dense, but I usually think that of most cake recipes that use melted chocolate. Would you say that the cake portion should be more poundcake like, or brownie like, or maybe something in between? Thanks for the great recipe and inspiration- oh, and I just saw the re-airing of the Bake-Off show on FTV- you rock!! This cake is particularly impressive looking. As soon as the kitchen is finished (sigh) I’ll have to try my hand at this one. Really enjoy your website and all the great pics. Carole, speaking of combinations, one thing you can do is go to Kraftfoods.com and search “cheesecakes”. They have a number of interesting varieties on the site, anyone of which could be turned into a bundt cake, I suppose. Michelle, changing the chocolate should be pretty easy. Just pick the moistest cake you can find,scale it down a bit and adjust the cooking time. If it takes an hour to cook, you won’t need to to the 15 minute “par-baking” of the cheesecake. Brenda, this isn’t that pumpkin-y tasting, but I think you’ll still like it. Tanya, I should put some ads on my site and target them at you ;). The money from the ads will pay my cream cheese bills. Corianne, is canned pumpkin hard to find in Holland? Ingrid informed me that corn syrup was. Julia, the sauce is Smuckers dulce de leche. It pours on beautifully at room temperature, then thickens and kind of sets when you chill it. I sliced the cake up and sent it off to the office. We’ll see what the verdict is. I LOVE this one! I’ll have to try it as soon as i’ll find some pumpkins overhere in Holland. It’s silly how many times I’ve come to your site and drooled over this pic! I know, I’m pathetic. Ha! I love anything with pumpkin so I will have to put this in my to try file! Yummm! It would take a lifetime to make all the possible combinations. Lauren, I’m pretty proud of this cake. I want to eat a piece now, but I have a cold and no appetite. Hi Debbie, I hope you had good luck with the recipes you tried. If you have questions about anything, just email me. Lindsay, let me know if you try it. You’ve outdone yourself with this one…I can’t wait to make it! HI, I’ve been reading this for several weeks now. I’ve tried a few of your recipes and can’t wait to try this new cheesecake Bundt cake! Thanks for all the new recipes. I love reading your comments too!!! Heck yeah. This one might be harder for Todd to take to work, so we may just keep it.